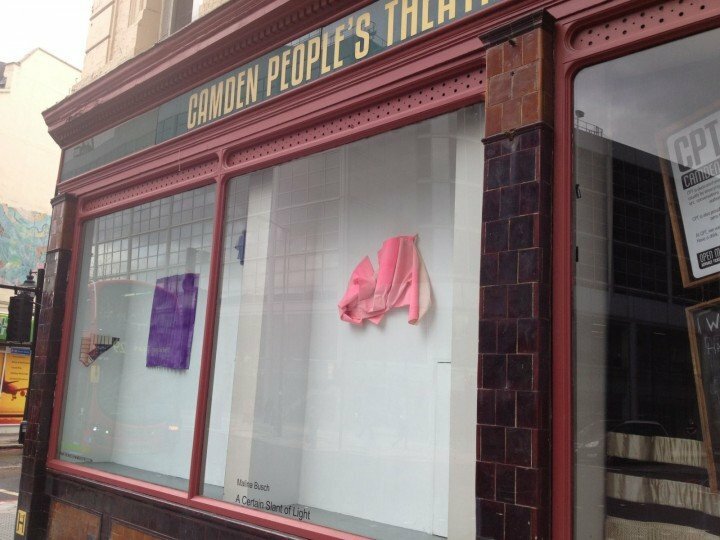 Camden People’s Theatre occasionally uses its large, deep, street-facing windows as a new emerging art space. Throughout 2013-14, this was branded as [email protected] and was curated by Aglaé Bassens. Although this arrangement has now ended, we are interested in continuing to support young visual artists by commissioning them to use this space. Please contact us if you are interested in exhibiting artwork in our windows. Located in Euston, overlooking the main road linking north London to the West End, CPT’s four large windows offer a great space for eye-catching new work to be seen by a wide variety of people: from passers-by to visitors, from the business community to Drummond Street diners, from the many students who work nearby to commuters at Euston and Kings Cross.